So I was early morning browsing on Craftster, and someone mentioned that Sarah's Yarns is having a sale on Artyarns Supermerino and whoops! 3 skiens fell into my cart. But I can't help it. I need a scarf for me for the move to the frozen north and I really want to do either a chevron, or a so called scarf, or a shifting sands. I'll probably swatch all 3. Plus, look at this colorway... gorgeous. I'm also making a bunch of progress on Flair. Yesterday morning I was able to put it all on waste yarn (hence the white yarn all over the place in the picture) and try it on. It fits! Yippee! I knit a bunch during the day and I'm now a good 2 inches below the armpits. I think the button holes are too close but I am just going with it. Hopefully I will have this finished in time to take it to Detroit with me in 2 weeks. Yes, DH has convinced me to go with him on his trip to Detroit, so I am going to spend another weekend in the cold. 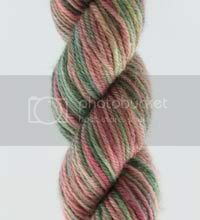 ooo love the pinky green yarn ! That'll be so pretty! I love how yarn just falls into our lives while we aren't looking. Good luck in MI but you could be pleasantly surprised weather-wise. 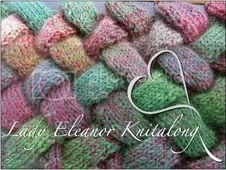 That's gorgeous yarn! I bought some in a similar colorway off Etsy but have yet to think of anything to do with it.